Natural Pearls (2) of 2.04 carats Gemstoneuniverse.com. Unique Implementation of Gem Therapy Selected Rings, Pendants and Talismans made available to Gemstoneuniverse.com patrons in April 2011. Comments Natural Pearl is all Nacre and one of the rarest gemstones in the world. Natural Pearl is also the gem that cannot be sold without a radiography report. It is a law! Here you can see a fine example of unique implementation of Gem therapy. 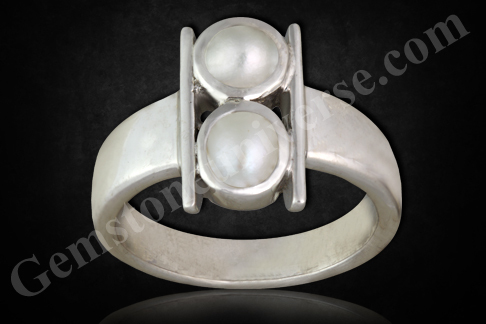 Tow natural pearls have been vertically mounted to make up the gem weight. The Gems are fine quality, all natural, qualify on Jyotish parameters and will surely deliver the results of the planet moon.Note: Alert: Dear Patrons as per Law Natural Pearl cannot be sold without a Radiography report that should clearly certify that the Pearl is undrilled.